SHIFT changes how teachers teach and students learn. 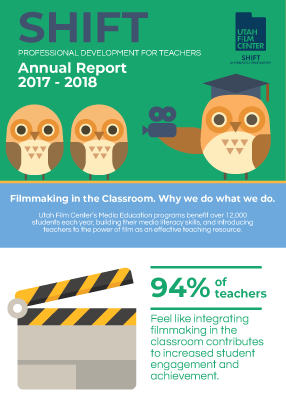 Utah Film Center’s SHIFT program offers grades 4-12 educators immersive, high-quality professional development and curriculum that supports the integration of the filmmaking process into educational settings. Workshops and instructional materials provide comprehensive, standards-linked lesson plans to guide educators on how to produce documentaries, public service announcements (PSAs), instructional videos, personal narratives, and other short film projects with their students. The SHIFT model is committed to strengthening teacher practice, increasing student achievement, and developing critical thinking, problem-solving, and communication skills. Inspire teachers and increase the use of creative technology integration. Stimulate classroom climate and excite students through the learning process. Increase student achievement through enhanced instruction. Welcome educators and youth leaders! If you work with youth in school or out-of-school, and are interested in integrating the filmmaking and other digital storytelling strategies into your instruction, SHIFT can train and guide you on how to produce documentaries, public service announcements (PSAs), instructional videos, personal narratives, and other short film projects with your students. Our workshops and ongoing trainings are most often grant funded (and therefore at no charge to you). We work with school districts and partner with community organizations to customize professional development experiences for educators to fit the needs and geographic location of desired participants. Please check our upcoming workshops page to find a workshop that works for you. We understand that teachers’ plates are most often full. For that reason we offer distinct professional development workshop models to accommodate busy schedules. Begins with a two to three-day intensive training followed by quarterly or monthly trainings throughout the school year. Customizable to fit your schedule and training needs. Typically it is a stand-alone hands-on 2 to 3-day workshop that walks educators through the filmmaking process and how that integrates into content instruction. 1 to 3-hour experiences typically at conferences and festivals that start with a youth media overview and introduces educators to the digital storytelling process and resources. Understand the fundamentals of the filmmaking process. Integrate creativity and relevant new technology to enhance teaching and learning. 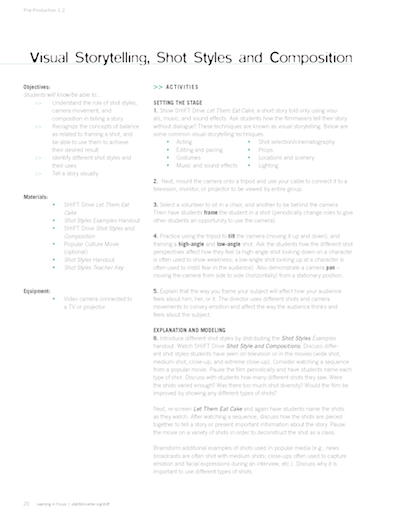 Design standards linked lesson plans involving the cinematic process. Celebrate the vision and voices of an emerging generation through digital storytelling. Feel more confident with project-based learning. Integrate critical and inventive thinking in the classroom. Participant incentives vary depending on the commitment level – all workshop participants receive a standards-linked SHIFT Filmmaking Curriculum Manual and eligible educators receive professional development credit for participating. To apply or register, please consult our “upcoming workshops” page. The Filmmaking in the Classroom workshops are two-day fully-funded workshops for educators and community youth leaders grades 4-12 interested in incorporating filmmaking and storytelling into instructional content. These hands-on professional development experiences provide 15 hours of in-depth direct instruction to teachers, providing them with an instructional skill set and media rich lesson plans to facilitate the production of content-linked documentaries, public service announcements, instructional videos, and personal narratives. Participants learn the fundamentals of cinematography, work in teams to produce short films, share ideas for classroom planning and integration, and learn how to use the process of filmmaking as an effective learning tool that motivates and inspires students. Furthermore, educators are trained on equipment and software they have access to in their classroom, including Windows Movie Maker, iMovie, WeVideo, tablets, video & still cameras, and tripods. 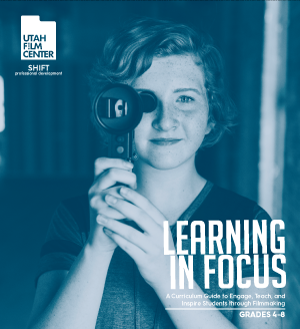 Join Utah Film Center’s SHIFT teacher professional development program for an eight-month professional development initiative to train STEM educators (grades 4-12) how to facilitate the production of student-produced instructional and documentary videos. Big Screen Science participants will be trained to integrate storytelling principles and the filmmaking process to craft compelling digital stories aimed at deepening content learning, enhancing STEM literacy, and exciting students about potential STEM careers. Framed by essential questions, this technology-infused training will allow teachers to explore how constructing cinematic narratives combined with intentionally designed lesson plans can increase student engagement, improve STEM skills, energize classroom climate. Free professional development training and mentorship. 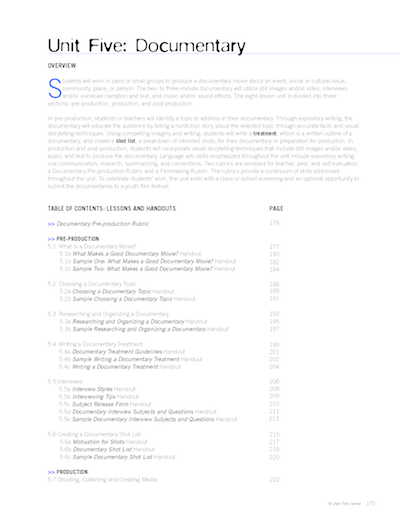 Comprehensive, standards-linked filmmaking curriculum manual that includes five filmmaking genre units and lesson plans, assessment rubrics, thumb drives containing youth-produced media, instructional videos demonstrating filmmaking concepts, and other additional resources. 2.0 USBE credit or 30 hours relicensure professional development credits – partial Educational Technology endorsement (9 of 18 credits). Access to online resources and support. Next-year Utah Film Center membership. How is filmmaking relevant and helpful to delivering the necessary content to my students? SHIFT’s highly praised and teacher-friendly curriculum guide makes implementing media arts in the classroom accessible and relevant. The 244 page resource guide, Learning in Focus: A Curriculum Guide to Engage, Teach, and Inspire Students through Filmmaking, contains five instructional units broken down into succinct lesson plans and a supporting thumb drive containing over 30 youth-produced short films, and digital versions of every handout. Click below to preview the Table of Contents and curriculum samples from Unit One: Filmmaking Bootcamp and Unit Five: Documentary from this highly regarded instructional resource. 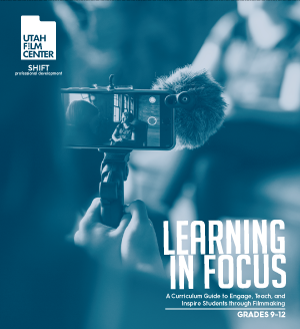 Order a copy of Learning in Focus: A Curriculum Guide to Engage, Teach, and Inspire Students through Filmmaking. *SHIFT provides a complimentary curriculum guide to every teacher who participates in their professional development training. Compelling youth-produced video work that SHIFT’s programming partners are creating with their students. Please view some of the compelling youth-produced video work that SHIFT’s programming partners are creating with their students. A sampling of videos that teachers have produced at previous SHIFT workshops. This collection of youth-produced films was created through various SHIFT programs, such as Adobe Youth Voices Film Camps, and collaborations. The spoken word animation pieces come from a collaboration of SHIFT educators and students who interpreted and animated two spoken word poems created by youth out of YouthSpeaks in San Francisco. 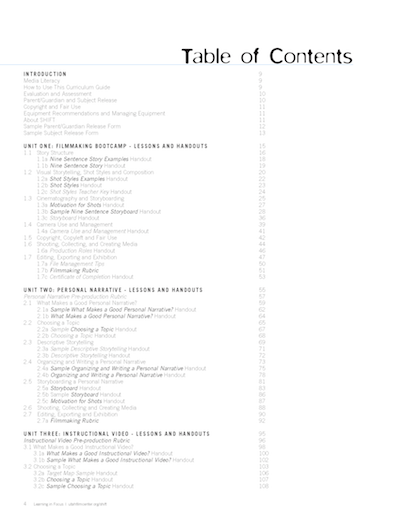 Below is an ever-evolving list of resources we find useful and believe you will as well! Click ‘Show Resources’ under header to view resources. Copyright For Educators: Resources that explain the legal issues related to the music, video, and pictures in digital projects. Note: These materials should not be understood as legal advice. For legal advice about a particular problem or concern, always consult a qualified lawyer. Copyright Free Resources for Video, Music, Sound Effects & Images: Refer to each site for copyright related to the site’s media. Media File Conversion Free Downloads: Check that the download is compatible your computer operating system. Distribution & Exhibition: Resources about sharing student work with a larger audience and sites for uploading student work. Movie Media Galleries: Movies and other media projects produced by students, teachers, and professional filmmakers. Media Literacy: Resources to help teach and strengthen students’ understanding of media literacy and their role as media consumers and producers. Project-Based Learning: Resources to help teachers construct and implement project based learning experiences in the classroom. Curriculum Resources & Lesson Plans: Digital media curriculum and lesson plan ideas for teachers to use and modify in the classroom. Professional Development: Sites with workshops or opportunities to enhance your teaching profession.